Why a pair of old socks gave away top German secrets? Why sniffing your own pee could save your life in a gas attack? What the 'Fat King' did with food scraps and dead horses? The facts known about First World War is very little, especially considering how it was completely overshadowed by the woeful Second World War (an allusion to Deary's subsequent Horrible Histories book). I consider myself to be fairly enthusiastic about history but looking back, I have read very little literature on the First World War as compared to the Second World War and hence, starting off with a Horrible Histories book is a good way to do it. The key demerit that I found in this book, which is common to many other books in the Horrible Histories series, there is more to the world than the UK, which the author must understand. Agreed, the author also did talk about Germany and the life in Germany but he covered no other belligerents of the war, barring some passing references to the United States. It would have been all right even if it had increased the size of the book by another thirty pages, but given a more clearer picture. I'd say that the book makes an excellent light read, and is fairly informative, on the first world war, but then, I can't overlook the fact of the author completely turning a blind eye to the other belligerents. So yeah, my rating for the book is a six, considering it was a good read, but could have been a lot better. 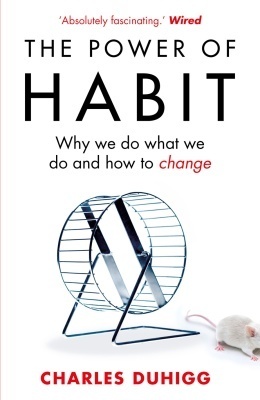 'In The Power of Habit, award-winning New York Times business reporter Charles Duhigg takes us into the thrilling and surprising world of the scientific study of habits. He examines why some people and companies struggle to change, despite years of trying, while others seem to remake themselves overnight. He visits laboratories where neuroscientists explore how habits work and where, exactly, they reside in our brains. And he uncovers how the right habits were crucial to the success of Olympic swimmer Michael Phelps, Starbucks CEO Howard Schultz, and civil-rights hero Martin Luther King, Jr. I started reading this book from Charles Duhigg having no clue as to what he was going to talk about and considering his background, I thought this was going to be on habits of business and purely a business related book. However, as I started reading, I realised that he touched upon habits in general and in fact, habits of successful organisations was only a part of the book, which is split into three; habits of individuals, habits of organisations and habits of societies and thus, this is a part self-help book and partly business related. 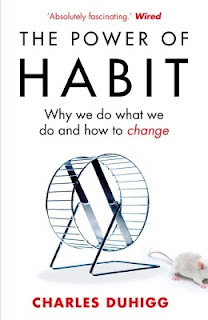 I liked it how the author started off explaining habits and formed a very simple equation for it, cue --> leading to routine --> leading to reward. The author then uses stories of how habits were created, with examples everyone could relate to, such as how Pepsodent's marketing in the early 20th century led to creation of a habit among the masses; regarding the success of Alcoa and Starbucks and finally, the spread of the Civil Rights movements in the United States and why the arrest of Rosa Parks' impacted whereas the arrests of other black women earlier didn't. I found it that the author had used all contemporary examples and not of obscure companies that people could not relate to. The author also addresses certain habits that people have which they are unable to control, such as smoking, drinking and gambling. While I, personally need not be concerned about any of them, like anyone else, I also do have certain habits that I am not too proud of and am unable to control and in that way, some of the tips given by the author was useful; especially, the appendix to the book. Giving all these examples is one thing but then, that would have been just another motivational speech. How to identify that 'cue' is always difficult and the author tells how one goes about it and gives tips, taking himself as an example. I also found some of the facts that the author said really interesting - especially regarding how the retail chain in the US, Target, find out what the customer wants even before she or he comes to know of their requirements. Yes, I have been to shops and have filled out 'privileged member' forms and cards and I even knew to the extent that they are least interested in offering you rewards for loyalty but then, little did I know that they used the data to understand your habits, develop algorithms and make bounty out of you. Moreover, considering that the author doesn't have technical expertise on the subject, with regard to neurology, the use of jargons was minimal and I could easily understand as to what point he was trying to make; though, I understand that the same could be a demerit for someone from the profession as they might have felt that the author was oversimplifying the matter, I maybe wrong but usually, what a plebeian loves is loathed by an expert. However, coming to the other side, I felt that the author gave a way too many examples. He had already successfully established the power of habit in the minds of the reader with the first few examples but then, he went on giving these examples for nearly 275 odd pages which was a little too much. Moreover, I felt that he over simplified the turnaround by Paul O'Neill for Alcoa; I agree that creating a culture of safety would have a domino effect on some of the other functions but then putting the entire success down to a single factor is akin to the single solution devised by the Communist Utopia for a macro problem and we all saw the dismal results it had yielded towards the end of the 20th century. 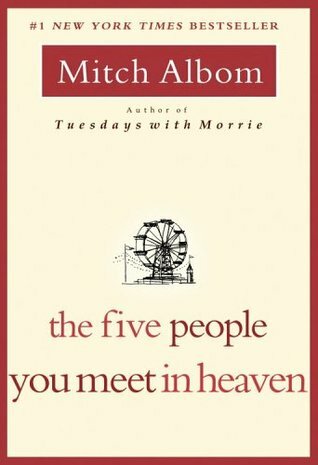 With that said, I would say that it is an excellent self help book, has got some really interesting facts and now that I think of it, I myself would have to implement some of those aspects into my life. A very good read, I give the book a seven on ten. 'Geography with the gritty bits left in! Deft death! by tucking into a poisonous pufferfish.... and surviving. Sudder! at ships lost for ever in the baffling Bermuda Triangle. Tremble! before perilous modern-day pirates who terrorize today's seas. Quiver! as you chew over the stomach contents of a great white shark. And if that's not odious enough for you ... read our roving reporter's guide to the seabed, uncover the dreadful details of the Titanic's last day and see if you're nautical enough to join the Navy. It's earth-shatteringly exciting! I am a great fan of the Horrible Histories and the Dead Famous (now Horribly Famous) series from Scholastic but little did I know the existence of a series named Horrible Geography till I came across the book at a throwaway price in a book fair and I was even more excited by the fact that the book was written by Anita Ganeri for I used to be a geography enthusiast back in school (perhaps still am) and used to visit the school library to read books on geography and hence, this was a familiar name. 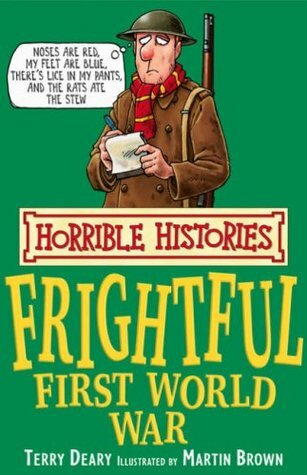 This book was similar to the Horrible Histories series, well illustrated and was filled with very interesting facts. 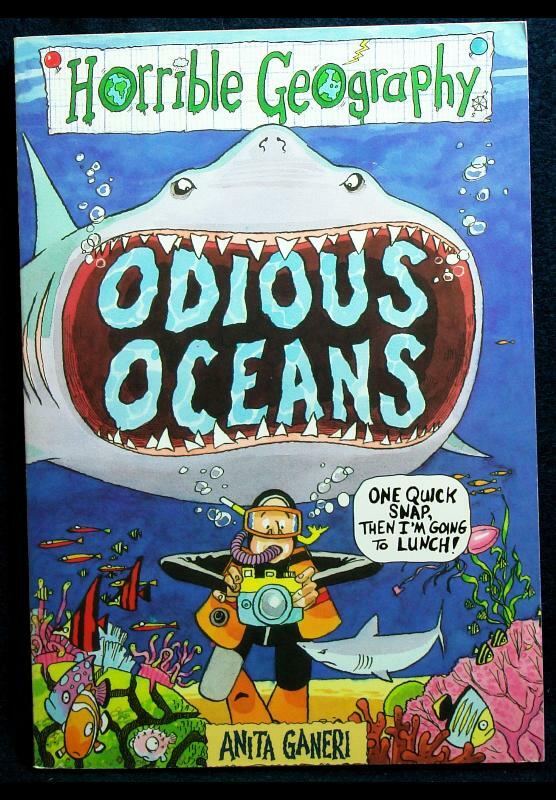 Even when I used to read those geography books, reading about oceans barely interested me but then, the author has done an excellent job to bring that interest, writing about several facts / mysteries known to everyone (Bermuda Triangle!) and also on what is under the sea, which contrary to what is visualised, is not a sand bed but has valleys and mountains and active volcanoes. Moreover, I really loved her 'earth shattering facts' and yes, considering that the book is meant for children, she didn't use too many of these technical terms regarding oceans, which is something that made the book enjoyable to someone like myself, for whom it has nearly been seven years since a geography book was touched. On the flipside, I found this book emphasising a little too much on history, especially, Magellan's journeys, much as it was a great feat, I really feel it had very little to do with oceans as such though you, as a reader may disagree with me on this. Moreover, this is something that the author could hardly be blamed for, there was too much content on seafood and myself, being a vegetarian, could appreciate what she has written, but hardly understand. 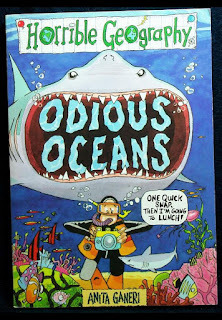 Like any other book in the series, I felt this was an excellent light read for a person like me and a very informative read for kids and yes, certainly more interesting than their geography text books from school.